Authentic, Vapor or Replica | What’s the difference? You might have seen these names before and not thought about it. You might also know what these names represent but haven’t got the time to read more about them. No worries! We are here to help you. Read through this guide and learn more about what the names e.g. Authentic and Vapor means, and what the differences are between them and Replica shirts. And by the way did you know that you can buy these shirts exclusively at Unisportstore.com? Back in the good old days we only used to have one type of shirt, which both the players and fans used. But with the players constantly improving their skills and abilities, they also have higher demands for their gear. You therefore see that the brands improve their technologies and shirts, so they help the players achieve their goals. You might think a shirt is a shirt, and we would like to agree to this. But there are some differences, which might not be spotted without taking a closer look at the shirt. Let’s start with the adidas shirt and see how their shirts differ. adidas uses the two different names, they call their performance shirt for Authentic and their fans shirt for Replica. This make sense so far! By comparing the shirts, you might spot some differences, but let’s go even further down in details now! You can spot that the crest, fit and material is different between the Authentic and Replica shirts and this is correct. The crest and adidas stripes are heat-transferred onto the Authentic Shirt, while the Replica Shirt has these details knitted in the shirt. Furthermore, the Authentic Shirt has and Authentic fit and is made for the athletes. The fit is made more elongated and tighter, and this gives a slimmer fit around the shoulders and waist. The Replica Shirt offers a looser fit, and this is perfectly made for streetwear use. To understand the difference between these two shirts we have to go more in depth with the geeky techs. The main difference is that adidas incorporate two types of technologies. The Authentic Shirt is made with the Climachill technology, while the Replica Shirt is made with the Climalite technology. The Climalite shirt is almost similar to the previous Climacool shirts, when it comes to material and design. The Climalite offers you to stay dry and comfortable by wicking sweat away from you body. The Climachill shirt offers a bit more. The materials are woven and lighter making it more comfortable. It is also breathable and quick-drying, so sweat is more likely to evaporate than sitting in the material. But how do the materials keep you cool and comfortable? Well, the fibers of the materials are woven with small aluminium silver dots, and these dots pulls heat away from your body. The Climalite material is also strategically placed in the areas where it is needed the most. You can therefore spot a lighter and thinner material on the back and on the forearms. Moving on to Nike and their shirts. Here we actually have three types of shirts. Nike has the Vaporknit, Replica Dri-FIT and Breathe Support, but we will just focus on the Vapor and Replica Shirts. Once again it can be hard to see the differences without taking a closer look and talking about the techs for the shirts. The Vapor Shirt is like the adidas Authentic Shirt, and the same goes for the Replica Shirts. The Vapor Shirt is the same shirts as the ones the players are going to use on the pitch, while the Replica Shirt is made for everyday use. Looking at the details of the shirt we see that the crest also is heat-transferred, making it seamless and comfier. Furthermore, the details around the shoulders are more visible on the Vapor than the Replica shirt, gives the shirt a nicer look. The place he shirts differ the most is once again the techs. The Vapor Shirt is engineered for players to use on pitch, and meantime also offering the best possible conditions for the players. The Vapor Shirt is made with the Vaporknit material, which is a knitted material that increases the airflow. The Vapor Shirt is also made with an Open-hole texture on the chest and back, which secures the players an optimal breathability. The shirt has an athletic fit, which makes it tighter and slimmer, while the Raglan sleeves follows your natural range of motion, making your movement feel more free and natural. The Replica Shirt is designed differently. The crest is knitted into the shirt and the shirt is also designed with the Dri-FIT technology and the lightweight Nike Breathe fabric. This combination will keep you dry and comfortable during the time you are active, while the Breathe fabric keeps you cool on the warmer days. The fit of the Replica Shirt is more loose making it more suitable for street and fashion wear. These are the basics of the differences between the Authentic and Replica Shirts. Are you fancying to get your own Authentic or Vapor Shirt? Then keep in mind that they have a slimmer and tighter fit, and in some occasions you might consider going a size up if you want your Authentic and Vapor Shirt in a looser fit! 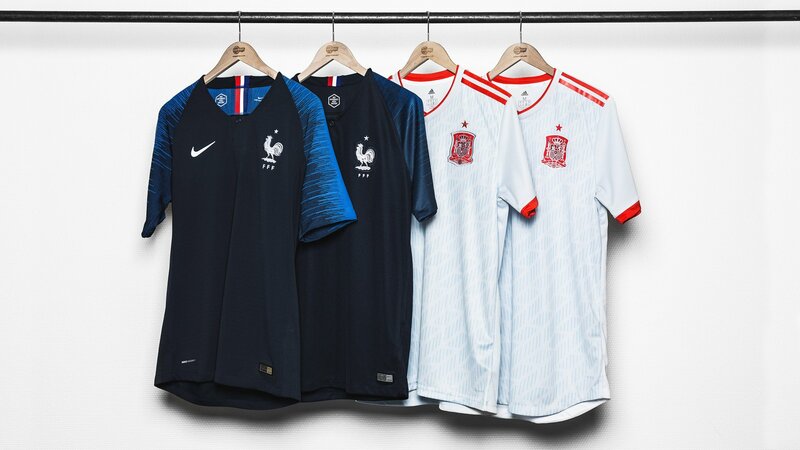 See our full range of World Cup shirts. You can find all the Authentic and Vapor from adidas and Nike here!